Children's Day and the ChowderFest have been canceled for 2014. There have not been any announcements about traditional concerts at City Hall Plaza on July 3 and 5. The normal Harborfest historic sites-related events calendar can be viewed at BostonHarborFest.com on the Daily Events tab. The separate July 3-4 Boston Pops Concerts will take place as usual at the Esplanade. Boston Harborfest celebrates the city's rich colonial and maritime history. The seven-day festival is also a celebration of the July 4th holiday and America's independence from Great Britain. There are more than 200 Harborfest events, with major happenings scheduled such as Children's Day, Party on the Plaza concerts, Boston Chowderfest, historic reenactments, and a maritime race and/or parade along Boston's waterfront. The other main July 4th celebration in Boston is the famous Boston Pops Concert with a large fireworks display at the Esplanade. The first Harborfest took place in 1981, and the festival is very similar in nature to the huge bicentennial celebration of 1976, and later Tall Ships maritime events. The Harborfest has expanded over the years, with many local businesses now hosting unique events during the week. Visitors can attend exhibits or lectures at Faneuil Hall or the USS Constitution Museum, enjoy a free concert at City Hall Plaza, or go on a whale watch or large sailing vessel. Many events are not free, but special exhibitions are added just for the Harborfest at many historic sites and other venues in the city. Wednesday July 3, 2013 is Children's Day on City Hall Plaza. Wayne Potash & The Music Fun Band will perform from 10:00 am to 3:00 pm at the Children's Day tent: "Singer/songwriter Wayne Potash leads The Music Fun Band in performing a sensational sing-a-long show for children and adults alike. Great new songs, old favorites and story songs about ‘bugs, beasts, fishes, and friendship’ are featured, accompanied by banjo, guitar and ukulele." The Town Hall Blues Band will also perform on City Hall Plaza from 4:30 pm to 7:00 pm: "Wayne Potash returns with a more grown-up show this time. The six all-pro members of Town Hall Blues Band perform a variety of classic and original blues, rock, and jazz." There is two main main concerts on Friday July 5, 2013 at City Hall Plaza. GUY will perform from 12:00 pm to 3:00 pm: "Guy is a dynamic acoustic guitar/vocals and drums duo stemming from Boston band The Pincushions, featuring cover songs from the likes of Sublime, Toto, the Police, Men at Work, and more. Guy recreates classic and modern songs with a unique, fresh, & soulful acoustic and rhythmic tone, sure to please audiences of all ages." DownCity Band will perform from 4:30 pm to 7:30 pm: "A high-energy, nine-piece dance band featuring a soulful female and male vocal duo up front, backed by a superior three piece horn section, driven by keys, guitar, and a powerful rhythm section that will keep guests dancing through the last song of the night." The annual Party on the Plaza will take place on Saturday July 6, 2013. The BaHa Brothers will perform from 12:00 pm to 3:00 pm. "The BaHa Brothers are a five-piece band that favors Jimmy Buffett, classic rock from the 1960s and 1970s and their own compositions." Primal Funk will perform from 6:00 pm to 9:30 pm. "Primal Funk is the hottest new band to come out of the northeast. This six piece group is made up of some of the finest and seasoned players around. All of the players have performed with or opened up for some of the best national acts performing today, such as Maroon Five, KC and the Sunshine Band, Tavares, The Temptations, The Four Tops, Tower of Power and many more." 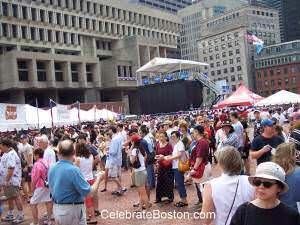 The famous Boston Chowderfest will take place on Sunday July 7, 2013 at City Hall Plaza from 11:00 am to 6:00 pm. Local restaurants compete for Boston's Best Chowder award. It's an all-you-can-eat clam chowder ticketed event for a moderate price. The restaurants take the competition very seriously and it's a great way to sample several different chowder recipes from some of the finest restaurants in the city. Attendees actually vote on which chowder was their favorite to determine the winner. Don't forget fireworks over the Charles River at the end of the Boston Pops Concert at about 10:30 pm. For details about the many Harborfest events during the week, check out the official web site below.